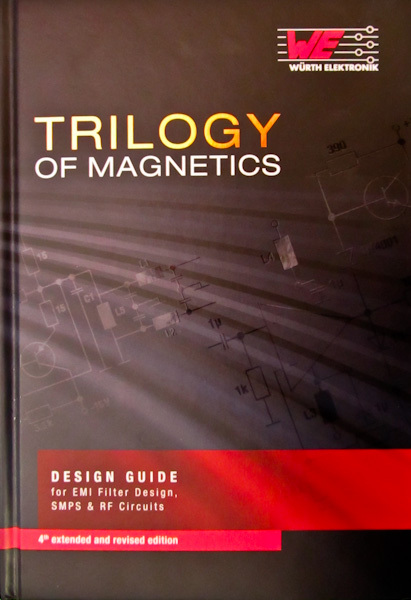 Many may not be aware, but Würth Electronics Midcom (WE Midcom) sells a monster 4-pound, 700-page book, the Trilogy of Magnetics, now in its 4th edition. The cost is 49 Euros or $49.99 USD, orderable through the WE Midcom web site or your local sales rep. This comprehensive design guide includes theory and applications for EMI filter, switch-mode power supply and RF circuit design. Now, many vendors supply application notes and white papers on their web sites or included with their catalogs, but usually, you need to wade through countless lists of products to find the meager theory and application information. While WE Midcom includes a few lists of ferrites in the book, the bulk of the content (99%) is packed with theory and applications. If you want the part information, that’s included on a CDROM in the back of the book. The CD also includes a copy of LTspice (from Linear Technology), plus a couple of WE selection/design programs. The book, Trilogy of Magnetics, by Würth Electronics, is well worth adding to your reference library. For a more detailed review, please check out the full article on the EMC Blog at Test & Measurement World (www.tmworld.com). This entry was posted in Reviews and tagged book, Review, Würth Electronics. Bookmark the permalink.